Cogit, a specialist in container management & pooling was founded in 1997 and provides containers for the food industry. Based in Mérignac near Bordeaux in France, Cogit turns over 9 mio Euro per year and runs 6 deposit located in France and Spain in which they clean, disinfect and store more than 3.5 million containers. Cogit’s customers are confident in their container management systems and more than 500 customers range from producers and distributors to industrial plants. Each day Cogit handles 37,500 container rotations, adding up to 75,000 rotations per month. Cogit is also currently the only company in France that offers RFID tagged containers to aid the tracking and tracing element of their container management system. 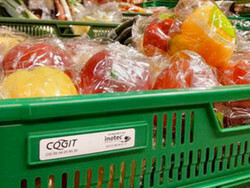 Cogit has recently fulfilled an impressive project with an large distributor of fruit and vegetables. 1.2 million containers have been identified with RFID labels and these containers are being rotated between 800 producers in France Spain and Italy and 300 retailers. The container management cycle controls an impressive 8.5 million rotations per year and a staggering 1 million RFID readings are recorded every week. This RFID solution has been developed together with inotec, the ID identification expert. inotec was asked to provide a label solution to identify the containers with self-adhesive RFID labels that withstand all weather elements and various washing processes. inotec developed a tailor-made RFID label which was tested by both Cogit and its customers. inotec’s RFID label solution was selected because of accurate identification and effective materials handling that could be achieved by the RFID labels. The filled containers are moved from the producers to a central distribution centre and despatched to the retailers. Continuous tracking and tracing controls are in place so that Cogit can locate all containers at all times. The system also updates customers about the status of their order, whether or not their containers are in the process of being filled with fresh products or if the containers are in the cleaning process. The specially developed software is being used which emails automated update reports to their customers. Guy Raluy, Managing Director of Cogit, proudly tells us that this project is the largest RFID project France: “I’m sure that the RFID technology ha a big future”. Although RFID technology is still the more expensive auto ID option within the logistics industry, Raluy hs achieved something unique and innovative for his customers. An impressive advantage to Cogit’s customers is the achievement of a reduction in loss of product. On average, Cogit’s customer’s fresh fruit and vegetable containers rotate 4 times per year with a loss o 3% per rotation. Assuming 1 million containers, 120,000 crates would be lost at €4.60ea. Cogit’s RFID tagged containers rotate 9 times per year with a loss of only 0.5% per cycle. “RFID helps to save money to the customer even if the acquisition cost of these labels is higher at the start”, says Guy Raluy. Guy Raluy is very pleased with the successful implementation of this project which will be a long-term success to the company. Cogit is also proud of achieving the minimal loss rate of 0.5% whilst the RFID system reads over 50 million RFID tags per year. This success rate is due to the premium quality of inotec’s RFID labels.